Have you been looking for a one-of-a-kind luxury vacation this year? Well we have the ideal destination for you. Koh Rang Noi is Phuket’s only private island. Now you can enjoy a fabulous opportunity and stay on this stunning private island. Koh Rang Noi is just a short 6 kilometers from the premiere Royal Phuket Marina in Thailand. This beautiful tropical paradise has been built on 25 Rai. It’s the perfect place for discerning guests. You can rent just a villa or the entire island. 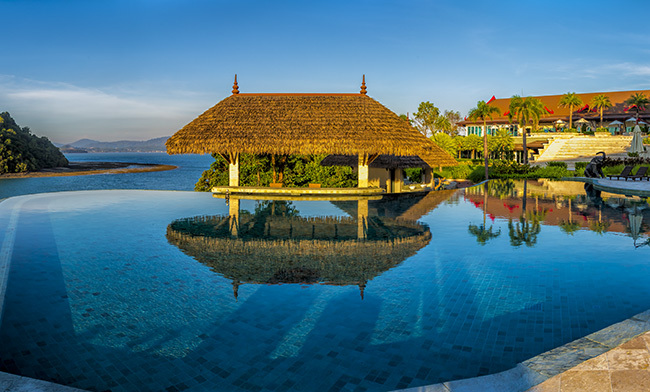 Your vacation in paradise begins as soon as you arrive on Koh Rang Noi island. You will first moor on the floating pier, then proceed walking to the beach sala. There, all guests are greeted by the attentive staff with cold towels and possibly a fresh coconut. You will quickly notice that the service is exceptional and nothing has been forgotten. The island of Koh Rang Noi is a tribute to Thai artisans of all kinds. As a result, at every turn is a Thai mural or beautiful Thai sandstone carvings. To take advantage of the island, your vacation will be filled with endless water options. Located just behind the beach sala is your personal toy box. There you will find 15 jets skis, kayaks, paddle boards and windsurfers. It’s a water sports dream come true. Plus, feel free to use 3 smaller sport boats for tubing and wake boarding. In addition, there are 2 Hobie cats. In case you are looking for something a little bigger or luxurious, you are in luck. Guests can rent the island’s very own Blue Water 70’ (foot) Yacht. Another option is cruising on ‘Majesty 56’ (Foot). Plus, the island also provides several transport boats to assist with picking up guests or supplies. We are happy to announce a unique “all inclusive” travel offer. It includes all F&G (Food and Beverage – excludes fine wines and premium spirits), plus your complimentary transfers, unlimited use of the spa and selective water sports. – Also included is one complimentary sailing on one of the luxury yachts mentioned above. The minimum stay required at Koh Rang Noi is 4 nights! If you want to plan that special social event, you can rent the entire island. That would include 19 bedrooms in total. Hence, a perfect to host a wedding, anniversary or any other special occasion. The luxury decor of the villas is spectacular. Some of the lights were utilized from the original Thai shadow puppets. It’s beauty at every turn. In fact, the entire Koh Rang Noi village was carved with amazing art for months. Attention to detail is evident everywhere. The doors and and even the headboards are a marvel to behold. Isn’t it time you begin living a luxury VIP lifestyle? Don’t waste another day. If interested in staying on Koh Rang Noi island in Phuket, Thailand, please let us know. Return again soon and follow our popular luxury blog. Read about the best travel destinations around the world.